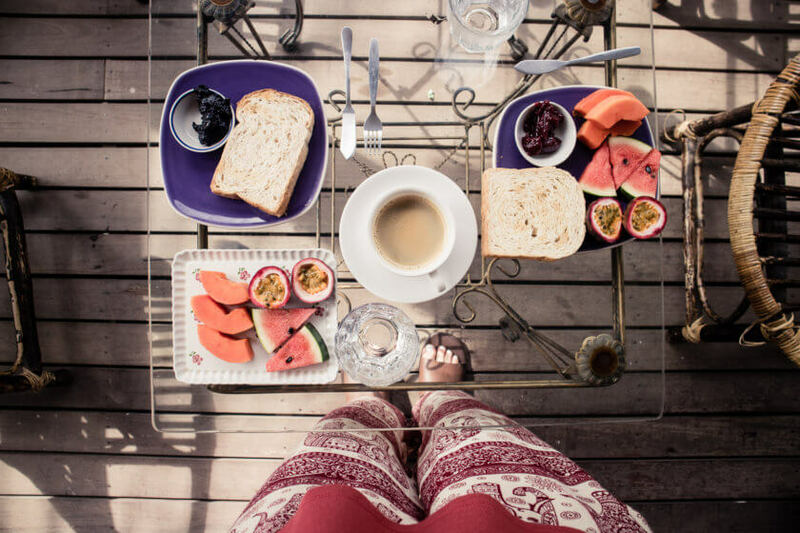 Travelettes » » Can you travel Thailand as a Vegan? Can you travel Thailand as a Vegan? My recent trip to Thailand was a trip for ‘firsts’. It was of course my first trip to Thailand – which ten years into my globetrotting ‘career’ is much later than the average. It was also my first trip to South East Asia, my first long-distance trip with my partner and my first proper holiday (not blogging-related trip) in a pretty long time. 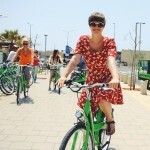 However, it was also my first trip out of Europe as a vegan – and that was something to be nervous about. Would it be possible to travel Thailand as a vegan? As a travel blogger it seemed only natural to me to put my research hat on, find blog posts on the matter and ask for advice in our Facebook group – but the responses were mixed. 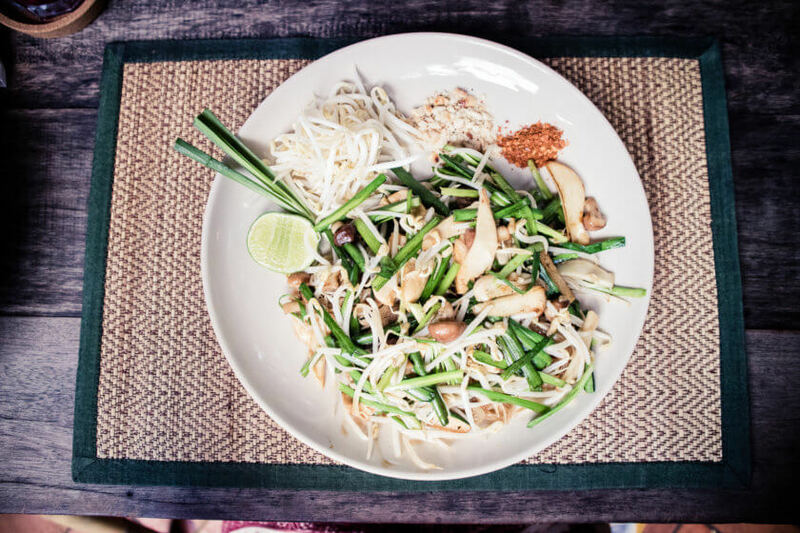 While some suggested we wouldn’t have any trouble finding vegan food in Thailand, others said that fish sauce is basically unavoidable and chefs might put it in even though the waiters tell you a dish is vegan… That didn’t sound so good. Where in Thailand did I go? Before I get into the details of my foodie experience in Thailand, I thought it would be important to tell you where in Thailand I went. I spent just over a week in Bangkok, visiting family who stays there, and about 5 days in Chiang Mai. This is crucial to keep in mind when you read on, as I didn’t find myself on a remote island, in an isolated island resort or any other place where food supplies might depend on the weather or tides. 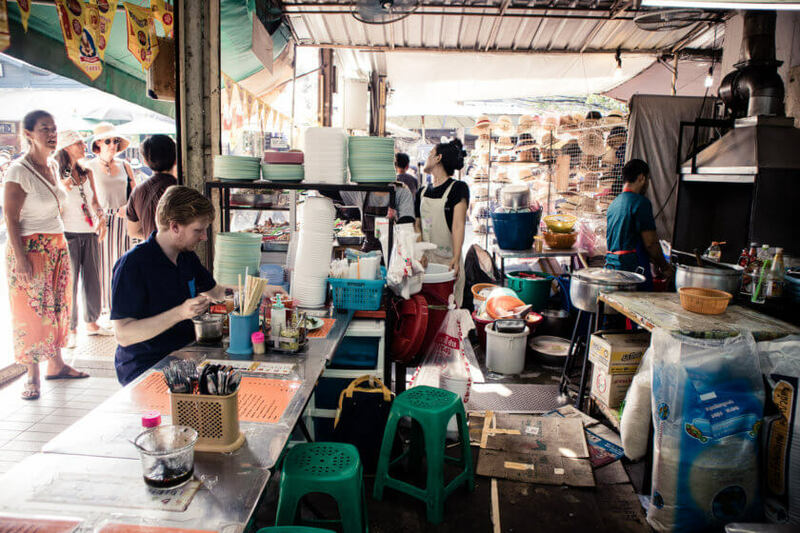 I spent all my time in Thailand in big cities, where restaurants were plenty and markets were always a great alternative. 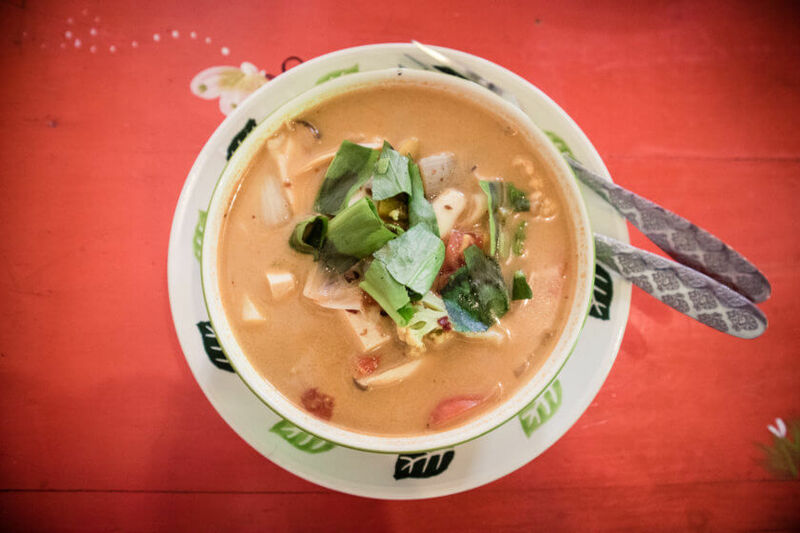 I even put Chiang Mai on our itinerary specifically because I had heard that it’s super easy for vegetarians and vegans there – and I wanted to see for myself what the hype was all about. 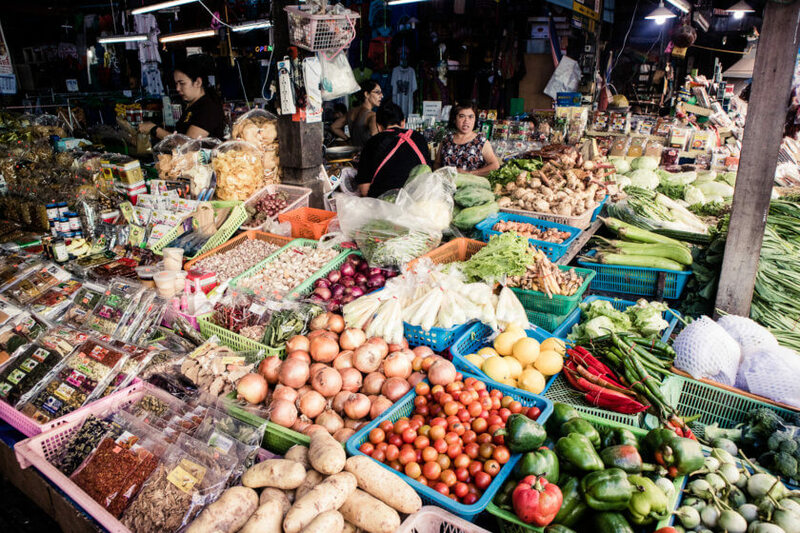 Is it possible to travel Thailand as a vegan? The good news is, YES, it is possible to travel Thailand as a vegan – at least when you focus on cities like Bangkok and Chiang Mai (I can’t speak for more rural regions or the islands – would love to hear your opinion)! Thai food is incredibly veg heavy and people working in restaurants are happy to adapt dishes, so ask for curries without fish sauce, pasta without cheese etc. However, I’m not going to lie and say it was easy. In fact it was quite difficult… Language barriers aside, I slipped up a couple of times. Veggie pasta covered in parmesan, an Indian dhal with a dollop of butter at the centre, tofu sticks from a street vendor that tasted suspiciously fishy – I made a lot of mistakes, but I learnt with every one I made. I couldn’t get myself to send any of the dishes back (I’m not allergic to dairy or eggs, being vegan is a lifestyle choice for me), mainly because I didn’t want anything to go to waste and I didn’t want to seem rude, but the next time I ordered I knew how to avoid bad surprises again. I hope that by sharing my experience here, you find it easier to be a vegan in Thailand. 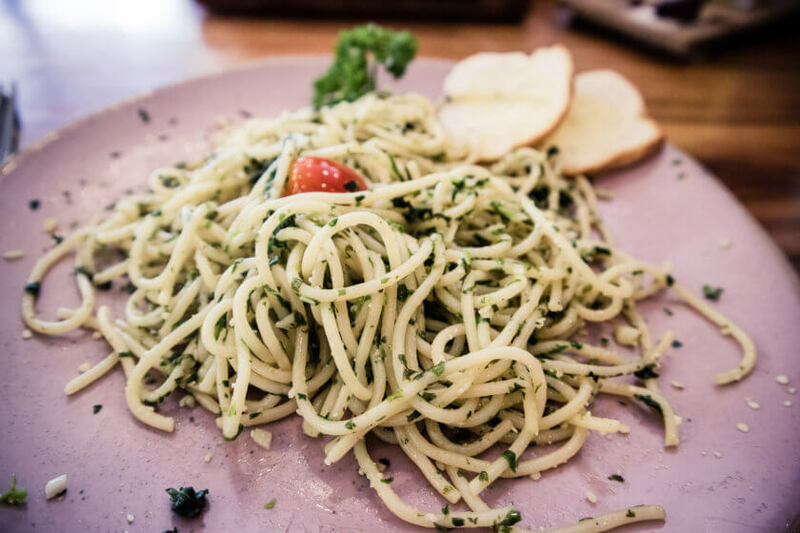 When you order pasta dishes, always add ‘no cheese’ as it seems to be standard to serve pasta already sprinkled with cheese. 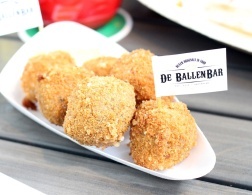 You will find many street vendors selling sticks of fried meats, dumplings and tofu. Unfortunately, I found out that the tofu is often marinated in fish sauce, so don’t eat it if you’re vegan! 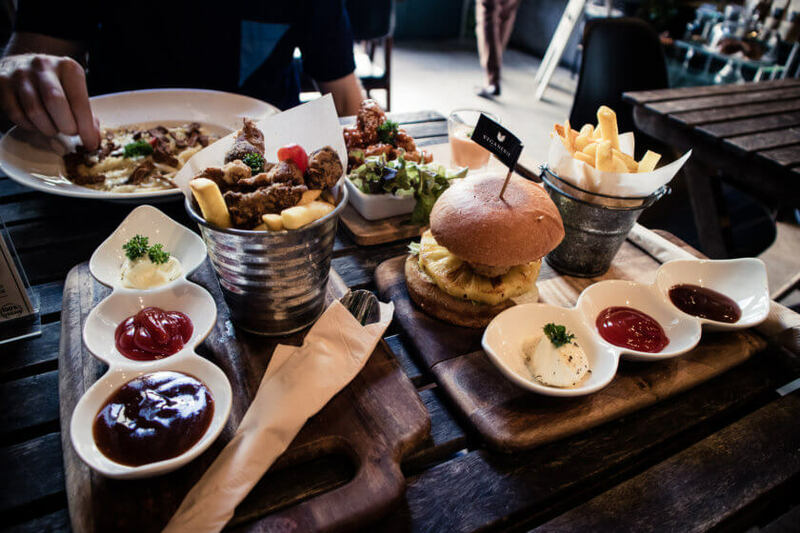 At markets look out for sit-down food stalls – they usually have a larger choice of dishes, so your chances to find something vegan (or adaptable) is higher. The Happy Cow app was – as always – very helpful in finding vegan-friendly restaurants and reviews. Look out for Indian restaurants as they are often vegetarian to begin with and can easily adjust dishes. Fruit is your best friend! Look out for smoothie bars or stalls wherever you go. The Vegetarian Festival is an annual tradition help in October. It has Chinese origins and for 9 days many restaurants and market stalls will switch to provide fully vegan meals. Keep an eye out for the yellow flags signalling their participation! You can find my 10 more general vegan travel tips here – particularly having a cheat sheet with vocabulary on my phone was super useful, as I could simply show the waiters the things I couldn’t eat. Finally, I can only repeat my own advice to not to be too hard on yourself. You might slip up, but stuff happens and then life goes on. Learn from my (and your own) mistakes and try to do it better next time. 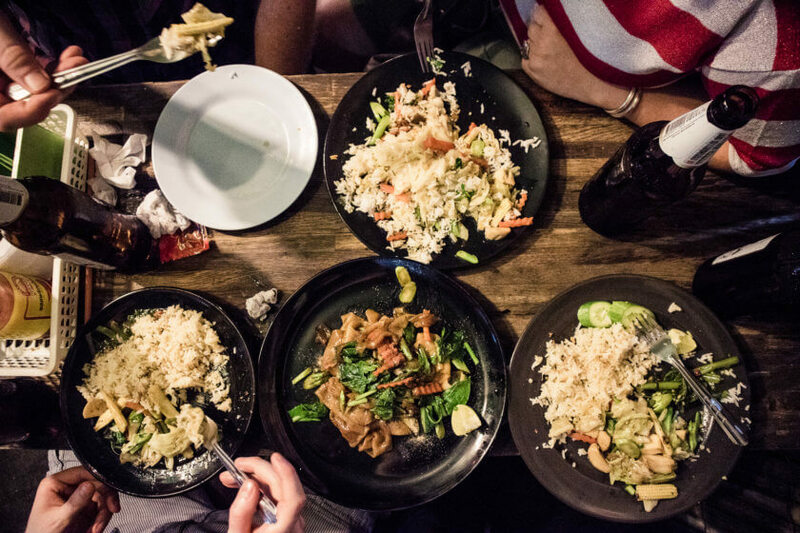 Finally, I wanted to leave you with a few recommendations for vegan and vegan-friendly restaurants in Chiang Mai and Bangkok. Since I was staying with family in Bangkok and ate at a lot of markets, I didn’t visit too many restaurants there. May Veggie Home (near Asok BTS station) is a fully vegan restaurant specialising in fake meats, which are usually soy-based. It was great to be able to order carefree – from chicken skewers with satay sauce to vegan pad thai and veggie spring rolls. They also had a wide selection of vegan desserts and while I was already really full from dinner, I could not resist and tried the black sesame ice cream – divine! Funny enough, I found out about Royal India in my Lonely Planet guide book – what’s that, you say? A travel blogger who follows a guide book? The thing about traveling as a vegan is, that research is key in order to find places you can trust. Royal India was a fantastic hole-in-the-wall restaurant just off the busy lanes of Chinatown. We ordered all the curries in the world and ODed on pakora and rotis. 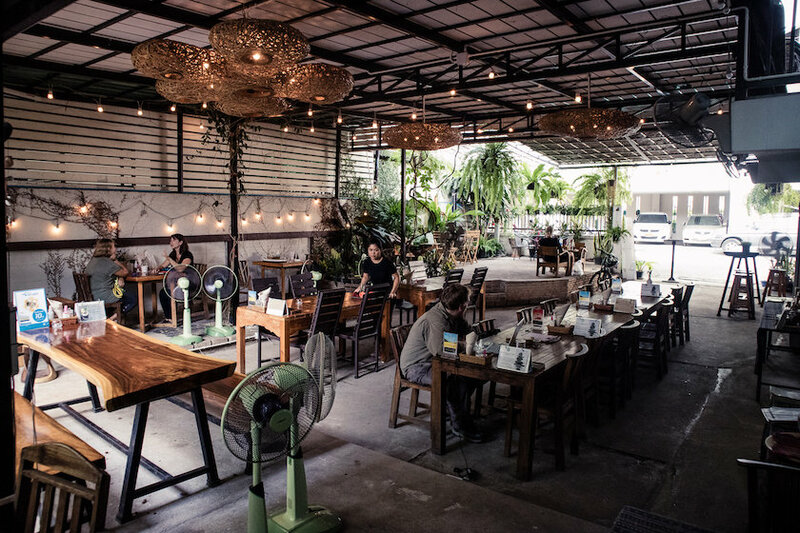 Staying in the Sukhumvit area, I often found myself at Iwane Goes Nature, a cool cafe on one of the livelier side streets off Sukhumvit road. There were not many vegan choices on the menu, but the ones they have are great! Really loved the pesto pasta and potato toast which are both labelled vegan, and the smoothies are to die for. My last vegan stop in Bangkok was Veganerie Concept, a beautiful vegan restaurant tucked behind Benchasiri Park (near From Phong BTS station). They are famous for their vegan fried chicken with waffles and the insanely good milkshakes and smoothies! This was definitely on the pricier side for Bangkok prices, but worth every penny! Even though Chiang Mai is smaller, I had a lot more choice here – and I tried a lot of restaurants. I’ll just name a few of my favourites below. My absolute favourite was the Bodhi Tree Cafe, a little cafe off the bustling main roads of Chiang Mai Old Town. The Tom Yum soup was the best I had throughout my trip and everything else we ordered was delicious as well! I found Food 4 Thought on my way back from a little scooter adventure in the hills and am so glad I did. The restaurant is a bit off the beaten track, but closest to the trendy Nimmana Haeminda neighbourhood. The atmosphere was very relaxed and the food and juices were just what I needed after a thrilling ride through the national park. 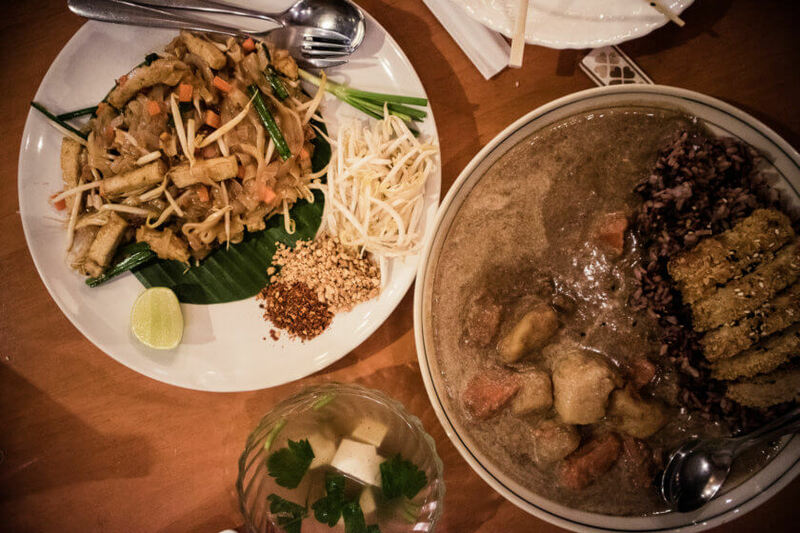 Amrita Garden is a little family owned restaurant in a traditional Thai house. Around the dining room you can find local art, which is available to buy. The family makes everything themselves, which explains why the prices might be slightly over the very low average of Chiang Mai restaurants. The food tasted amazing though and the atmosphere was priceless. 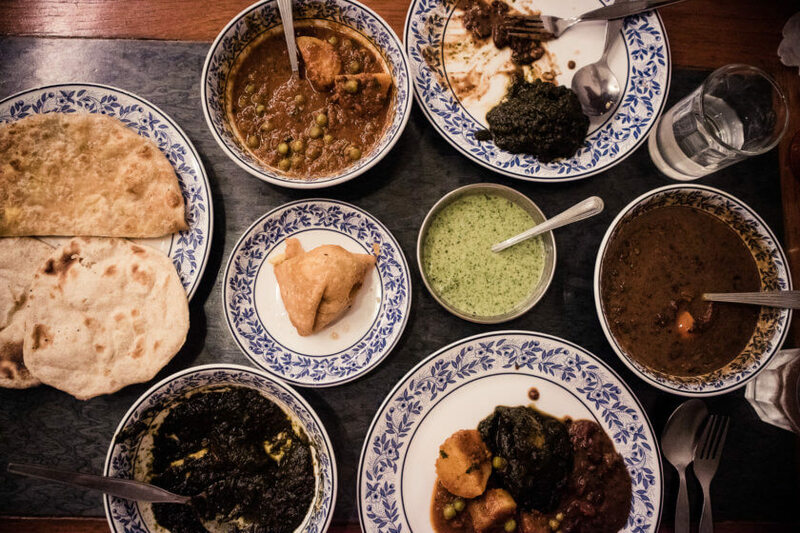 I ate at New Delhi Indian Food because of its incredible reviews. The food was unbelievable and the staff very helpful in making sure everything was vegan. 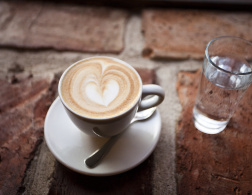 Reform Cafe was another favourite – I ate here twice in five days! 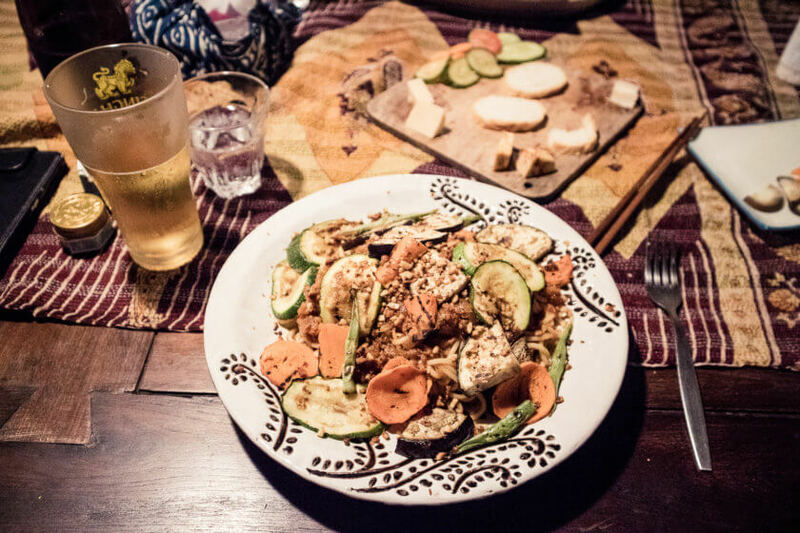 The restaurant is part of a vegetarian guesthouse and all the food is 100% vegan. 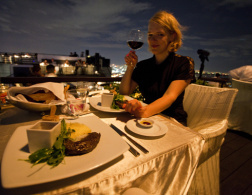 They serve traditional Thai dishes as well as western dishes such as pasta or burgers (the burger is amazing). If you’re vegan and traveled through Thailand before – particularly the many regions that I didn’t get to visit this time – I’d love to hear your thoughts in the comments! 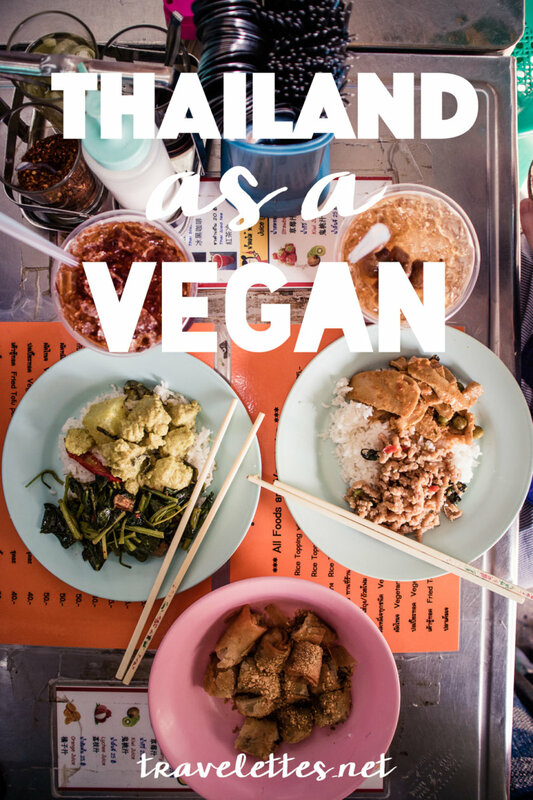 Was it easy or hard for you to travel Thailand as a vegan? I soon learned to always add "no egg" when ordering food in Thailand. The fish-sauce can´t be avoided unless you go to strictly veg-restaurants. It is so important not to be too strict with yourself. I decided to eat vegan as much as possible. If not I would be okay with vegetarian. I visited Bangkok, Chiang Mai, Ao Nang (pretty easy to be vegan) and the Samui Islands. This was an awesome post - I have a friend who would be interested in this information and I'll pass it to her! We just recently returned from Thailand too. We LOVED Vegenerie Concept - the ice cream and waffles, oh my gosh yum! We also spent time on Phuket and on Koh Mook. Koh Mook was a somewhat of a challenge since it's a remote island but we e-mailed our hotel ahead of time and they prepared dishes for us. Phuket was easy as it's a large island. We highly recommend checking out Santosa Wellness Spa, they have a vegan restaurant on site and it's delicious! VeganTravel on YouTube has quite a few good resources for travelers going to Thailand.